Oh, the irony. Honeywell introduced a round thermostat way back in 1953, but abandoned the shape in favor of rectangles in 1960. Thermostat manufacturers relied on that basic industrial design for the next 40 years, until the geniuses at Nest resurrected the round—and disrupted the industry—in 2011. 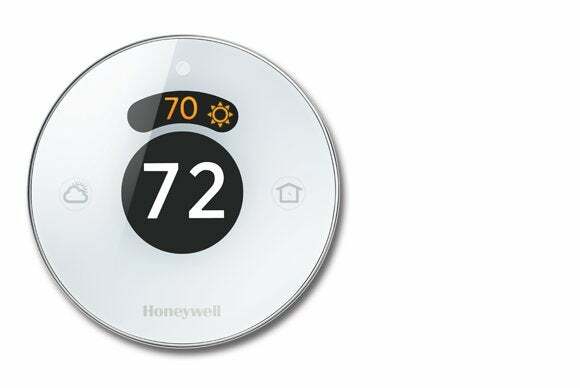 Now Honeywell has an all-new round thermostat of its own. The Lyric doesn’t sing, and it won’t learn your daily routine like the Nest will, but it’s not entirely dumb. I’ll discuss the Lyric’s capabilities first and relate my installation experience second. That might seem backward, but you won’t care about installing it if you decide it doesn’t meet your needs and expectations. The Lyric’s suggested list price is $280 ($30 more than the Nest Learning Thermostat). Honeywell is running a promotion that brings its price tag down to $229, but it’s still not an impulse buy. The Lyric features an attractive industrial design that’s just different enough from the Nest to avoid outright imitation. You move a ring around the exterior of the thermostat to set the desired indoor temperature, which is displayed on the smaller display on top of the Lyric’s face. The Nest works that way, too, but the original Honeywell Round also had a ring (although it was on the face, not the outer edge, so who's the copycat?). LEDs cast a ring of cool light on the wall behind the Lyric. You can override the Lyric's geo-fencing when you leave the house, but you can't control it from the web. The larger display in the middle shows the current indoor temperature. Press the cloud/sun icon on the left-hand side, and this will change to show a periodic weather forecast. Pushing the home button on the right-hand side informs the Lyric that you’ll be leaving the house, so the HVAC system should be idled to save you money. A proximity sensor brightens the display when you approach. Like the Nest, the Lyric knows when you’re away and when you’re home desirous of indoor climate control. Unlike the Nest, the Lyric doesn’t learn your comings and goings so it can develop a schedule based on when you’re home and when you’re away. And since there isn’t a web interface, you can’t change the heat/cool mode or set the target temperature remotely. You also can’t manually program the thermostat to heat and cool on a schedule. On the bright side, the Lyric is outfitted with a humidity sensor that can trigger the ventilation system to move air around your home if the humidity gets too high (increasing the chances of mold growth). The Lyric can tell you about the weather, too. Where the Nest depends on your walking past it to set off its proximity detector, the Lyric relies on the geo-fencing parameters you put into its smartphone app. Set a range—your choices are 1/4 mile, 2 miles, 4 miles, or 7 miles—and the app will create an invisible circle with a radius of that distance on its internal map. The instant you travel outside that circle, the thermostat will put your HVAC system into “away” mode to save energy. Come back inside that perimeter, and the thermostat will resume heating and cooling your home. Setting the range to 1/4 mile will delay your gratification, but save energy. Setting the range to 7 miles will give your HVAC system more time to heat or cool your home, but it will consume more energy. The performance and efficiency of your HVAC system will also play a significant role here. 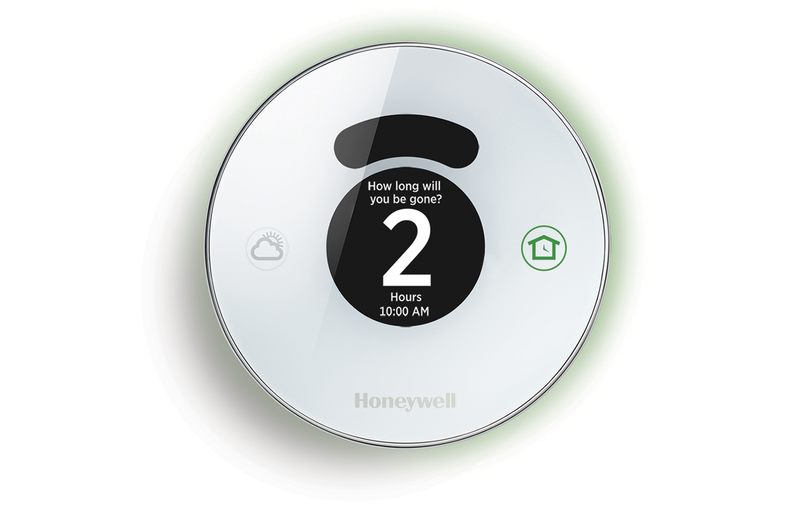 You use Honeywell's Lyric app to set the target temperature when you're home and when you're away. Geo-fencing sounds absolutely logical, and some high-end connected-home systems (Vivint and others) use the technology for similar purposes. It worked perfectly for me on the Lyric, lowering the temperature in this early winter (I live in the Midwest) each time I crossed my geo-fence, and boosting it back up so my home would be comfortable when I returned. If multiple family members have smartphones, you can have each of them install the Lyric app and register their phones so that your HVAC system goes into “away” mode only after the last person leaves. Nonetheless, there are limitations to what geo-fencing can do. If other family members who don’t have smartphones (or visitors with smartphones that aren’t registered to the thermostat) remain home when you leave, they might take it upon themselves to override the thermostat’s programming to maintain a comfortable temperature while they’re there—and they probably won’t remember to reset it when they leave. Here’s another scenario: If your smartphone battery dies while you’re outside your geo-fence, the thermostat won’t know when you cross back into your home zone (so keep a phone charger in your car). As I mentioned earlier, round thermostats are definitely old school. As such, installing one in place of the rectangular model I had before left me with some touch-up painting to do. I had the same issue with the Nest, but the Lyric’s plastic construction looks relatively cheap compared to the Nest’s steel and glass material. 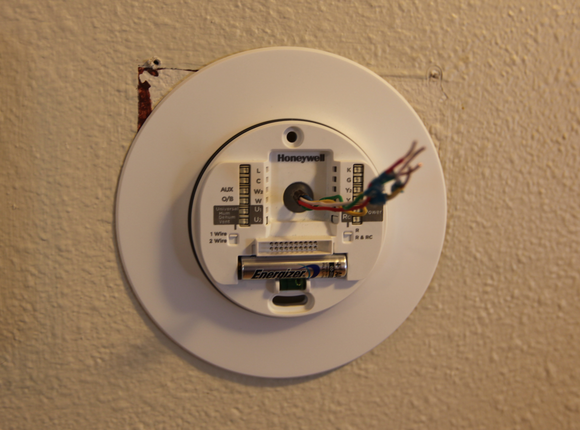 You’ll need to install three components: an optional wall plate that can hide old holes; a mounting plate that you wire your HVAC system to; and the thermostat itself, which snaps into the mounting plate. Honeywell provides an app for Android and iOS devices that steps you through the installation process. A printed instruction sheet would serve better, since you won’t care if you drop it. As with most thermostats, the Lyric comes with an optional plastic ring designed to cover the holes from your old thermostat. Like most, this one isn't big enough. Cut power to your furnace (and air conditioner, if you have one) before you disconnect your old HVAC system, label the bare wires, and then thread them through the hole in the center of the Lyric. Push the wires into the appropriate sockets on the thermostat. The Lyric supports a variety of HVAC configurations, including dual-stage heating/cooling systems and heat pumps. Once the wires and an AAA battery are in place, snap the component with the display into the plate that’s mounted to the wall (the absence of a satisfying click left me wondering if I’d established a secure connection). 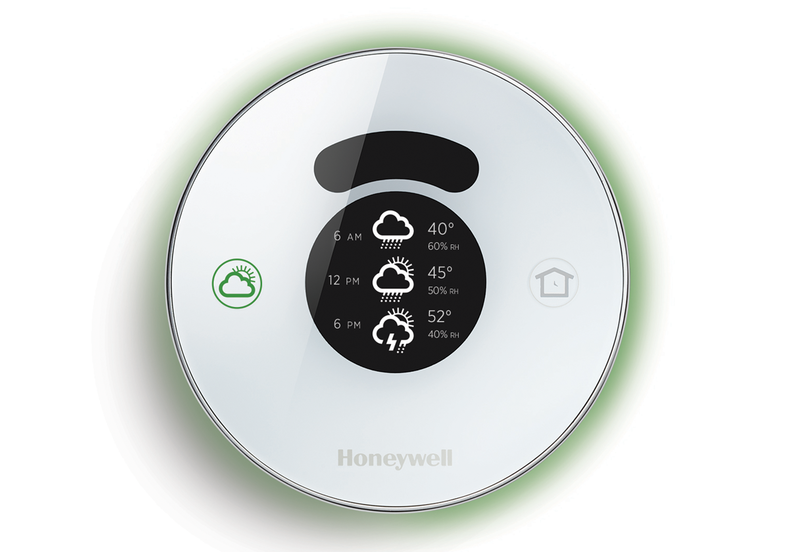 If the thermostat fires up, instructing you to install Honeywell’s app on your smartphone, your installation was a success. For me, the entire process took no more than 20 minutes to complete. The Nest looks and feels like a premium product on your wall. The abundance of plastic in Honeywell’s Lyric makes it feel cheap—even though it’s anything but. And where the Nest lets you bypass its much-hyped learning feature to program it manually, Honeywell is so proud of its geo-fencing feature that it provides little in the way of options. If you discover geo-fencing doesn’t work for your household, too bad. I was also surprised—and disappointed—to discover that there’s no provision for adjusting the thermostat via the cloud. Web portals that let you adjust or program your thermostat are common with even the least-expensive programmable thermostats. Honeywell’s Lyric didn’t leave me cold, but I can’t recommend it in its current state. Geo-fencing is probably a better solution than an algorithm that takes time to learn your home/away patterns, but that feature alone isn't enough to justify the Lyric's high price tag.